You've only got one body. Take great care of it with supportive chiropractic care. Most insurances cover your care. Call us today to get details for the non-invasive treatment for your disc or nerve related conditions. Orthopedic injuries or a car accident victim? We will provide you with the care and everything else you need to recover from your injuries. Massage Now Offered! Call to Set Up Your Appointment Today! Sign-up using the form or call us at (270) 527-2007 to take advantage of this exclusive offer. 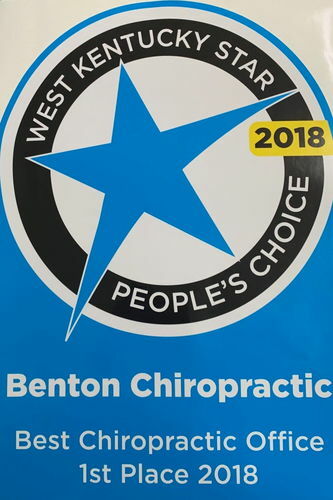 Voted Best Chiropractor in Western Kentucky!! For more information or to schedule an appointment with our doctor, call (270) 527-2007 today! Located in the growing community of Benton Kentucky, the highly trained health professionals at Benton Chiropractic are dedicated to helping you achieve your ultimate health and wellness goals. Dr. Zach Leible is committed to bringing you better health and a better way of life by teaching and practicing the true principles of chiropractic wellness care and rehabilitation. Patients seeking treatment at Benton Chiropractic are assured of receiving the highest standard quality of care through the use of chiropractic manipulations and always updated rehabilitation to maximize the patients results. There are many reasons that people seek chiropractic care. Often it is for relief from neuro-musculoskeletal problems (sometimes called “pinched nerves”) like back pain, neck, arm, shoulder, sciatica, leg or sacroiliac pain. Many times “pinched nerves” cause not only pain, but numbness and tingling or a pins-and-needles feeling in the fingers or toes. Although most people first go to the chiropractor because of a specific health problem, after they see all of the benefits chiropractic has to offer they schedule periodic visits to simply maintain their spinal alignment and optimize their health. 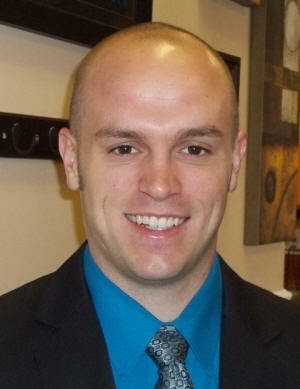 Dr. Zachary Leible is a chiropractor serving Benton and the surrounding communities. Our chiropractor and the rest of the friendly team at Benton Chiropractic are dedicated to chiropractic solutions to target your unique needs, whether you are suffering from back pain, neck pain, headaches, or even just plain old muscular tightness and tension. You may need pain relief after suffering an accident, experiencing an injury, or if you have a specific condition such as chronic back pain or a spinal condition; even if you just want to improve your overall health, our chiropractor can help you achieve your wellness goals! Please visit the testimonials page to see what our patients are saying about our Benton chiropractor and getting regular chiropractic treatments. At your first visit to Benton Chiropractic, Dr. Zachary Leible will explain the science behind how chiropractic care works, and give you a full evaluation to see if chiropractic care is right for you. If there is a good fit, we can develop a plan of chiropractic care that is specific to your condition and health goals. If you have not been to a chiropractor before and want to find out more, please email us or call (270) 527-2007 to receive the answers to your questions from our experienced team. We also welcome referrals, so we invite you to share our chiropractic and wellness information with your friends and loved ones. Since I was young Chiropractic has been part of my life. Growing up I can remember my parents going to our family Chiropractor. I was a teenager the first time I experienced chiropractic myself. I sustained an injury to my lower back while lifting weights in high school. "Dr. Zach is a great Chiropractor. He helped relieve my shoulder pain. I would refer my friends and family to Dr. Zach any day!" "I came in with a lot of back problems but thanks to Benton Chiropractic, almost all of my issues have been resolved. Dr. Leible is very informative and does a fabulous job of explaining things so the patient understands. I will continue to give him all my business and will refer anyone who as issues to him." "Dr. Zach has helped me tremendously throughout both of my pregnancies. He has also helped with my past back injuries. By far, this is the best chiropractor I have ever been to. I highly recommend him to all my friends and family!" "Benton Chiropractic has helped my back very much. I slipped in some water and messed my back up very badly. The exercises that were shown to me, the decompression table and the adjustments have helped tremendously. The doctor and his wife are very awesome people. This is a great place to go if you need great care." "Before I began treatments, I had terrible tension headaches, lower back pain and hip pain. I haven’t been having any of these issues after being seen just a few times. All of my pain was well addressed and continues to be well addressed when come in for care." "I was a server for ten years and then became a nurse. Needless to say, I have back issues. Since coming to Benton Chiropractic, I sleep better, I can do my job better, I have less headaches and I feel better overall every day. I have recommended most of my family and they loved it as well. Great experience with wonderful people at Benton Chiropractic." "I have been coming to Benton Chiropractic for five years now and their work here has kept me working. I would not go anywhere else. For the best and most courteous service, come to Benton Chiropractic." "When I first came to Benton Chiropractic I was in a lot of pain. I was coming three times a week. After a month, I felt much better, although I still have some bad days. I’ve never been somewhere I can make appointments so easily and they really take time for you and they’re very nice." "I’ve been to a few chiropractors and Dr. Zach is by far the best. He is always ready to address my concerns and problems. I came in for sciatica pain and after a month of treatment the pain was gone. I still come here for regular adjustments. Thanks Dr. Zach!" "Dr. Zach has been a life saver. I have been going to a chiropractor for over fifteen years. Dr. Zach has shown me stretches and exercises that have really helped me. I don’t have to visit as much." "I chose this practice after an auto accident. My left side/hip area was bothering me. So far so good! I would highly recommend Dr. Leible. He provides excellent service and takes the time with each patient. Fast, friendly service!" "I’ve been to four different chiropractors. He is BY FAR the BEST that I’ve been to! I hate manual adjustments until seeing him. He is super GENTLE and has helped me IMMENSLEY!" "Dr. Leible has definitely helped my low back and neck. I would refer him to anyone." "I have been seeing Dr. Zach for a little over a year; I came in pain with a sciatic verve with my right side. Since, I have felt like a new person. After about 2-3 visits, I could see a major difference. Family friendly atmosphere, very welcoming! I would highly recommend!!" "I’ve been coming to Benton Chiropractic for years and now have little to no migraines." "I had never been to a chiropractor before, but after breaking my leg and many years of pain management a friend suggested I come. The treatment was amazing and relief was immediate. Dr. Zach and his wife are wonderful people and I would, and do, refer all of my friends and family." "Since day one of coming here it has been a great experience. Not only has my back and neck felt better with each treatment, but you are met by some wonderful people. Dr. Leible is great at what he does and easy to talk to! And his staff always has a smile!" "He really knows what he is doing and takes the time to answer your questions. My husband feels so much better since he has been coming here." "I have had ankle pain for a long time. Dr. Zach adjusted me and gave me very helpful exercises to do at home. I’ve felt relief! I appreciate him and the staff at Benton Chiropractic so much!" "When I first started, it helped me so much. I moved and couldn’t come for a while, and now I am getting to see him again. I have MS and a lot of trouble with my neck and back and now he is getting me back in shape. Thanks to him!!" "I am 50 years old and I’ve done a great deal of hard labor through my life and I have had 3 major back injuries over the years. I have been seeing Dr. Zach for a couple months now and can’t believe the amazing results I have had reducing my back and leg pain. I can do things now that gave me pain before. Live a normal life! Thank God and Dr. Zachary Leible D.C. Benton Chiropractic!" "My last 3 pregnancies I have come to Leible for adjustments, especially towards the end. I’m very grateful for him, that’s the only way I could walk as I neared 40 weeks. Also, I’ve dealt with vertigo for the past couple of months and he has always been able to calm it down. Everyone at Benton Chiro is amazing and always there to help anyway possible." "Thank you for adjusting my neck and helping me feel better. Also for helping me learn to sleep with only 1 pillow." "Both of my daughters have come to Dr. Zach for sports related injuries. He is exceptionally knowledgeable and amazing with his sports medicine expertise. He offers a friendly environment and excellent treatment! Awesome!" "I truly love coming here. They have a wonderful staff. Dr. Leible has fixed me so many times. He is working on my son too. I recommend them to everyone who will listen. 5 stars for me!"